Some believe that if the blood channel could be located then it can be proven where the Temple once stood on the Mount. I feel that the rest of the ruins, also at this location, prove this without knowing the location of the blood channel. 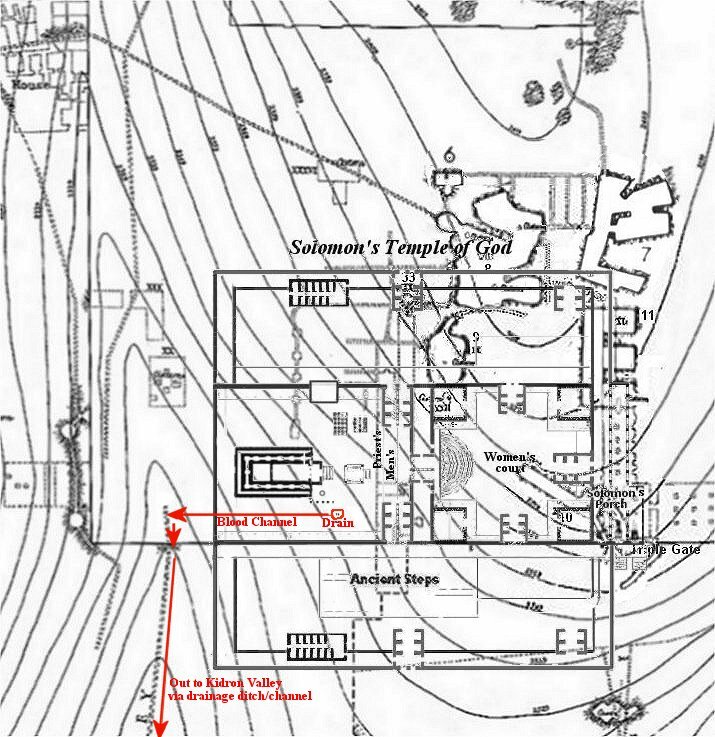 However, I couldn't help but notice a certain channel/drainage ditch on this map of Sir Charles Warren's that could well be connected to the blood channel. The blood of each animal sacrificed was let into a bowl by the priests. The blood was sprinkled on the altar and the remainder and was then poured down a drain in the court. Needless to say this was only a very small portion of the blood running on the Priest court to the drain. Most came from the area of the racks or hooks where the animals were hung to drain the carcass of the remaining blood. It isn't a small amount of blood during a feast time. Solomon sacrificed 22,000 cattle and 120,000 sheep and goats on the day he dedicated the altar. In later times as the population grew so did the number of animals being sacrificed. That was a lot of blood to be disposed of. How did Solomon's architects solve this problem? 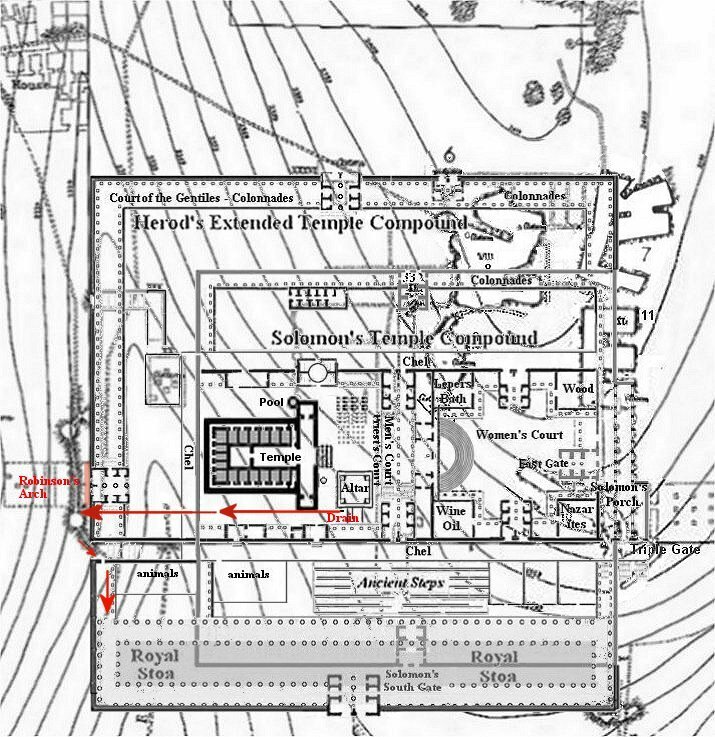 In Herod's Temple the altar was moved toward the south and the drain was said to be at the southwest corner of the altar. There was a trap door in the priest court next to the drain where a priest could go down into the blood channel and clean it out if it became clogged. When Herod built the temple, the inner wall, and the southwest corner, it cut off both Solomon's drainage ditch and also the city drainage ditch. A new extension of the city ditch was built skirting the corner of the new walls. At this time a new blood channel was extended over to this new section of the city drainage ditch. 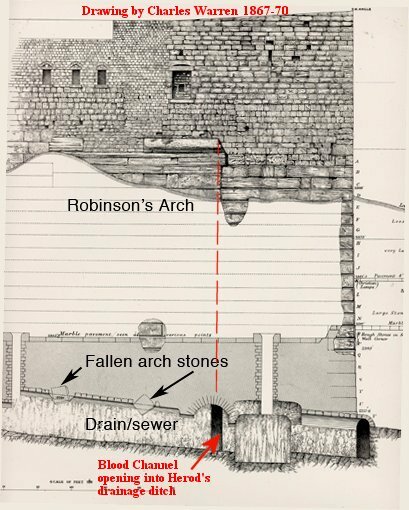 As you can see in the map below the blood channel would empty into the drainage ditch in a direct line and be located near the south side of Robinson's Arch. The blood was diluted with water each evening when the Priest court was flooded with water, and the mixture went down into the drainage ditch which flowed down along side of the City of David and ultimately dumped into the Kidron Valley. exactly where it should be according to my location for the Temple and the drain. The drainage ditch has been excavated and tours are availble to the public.